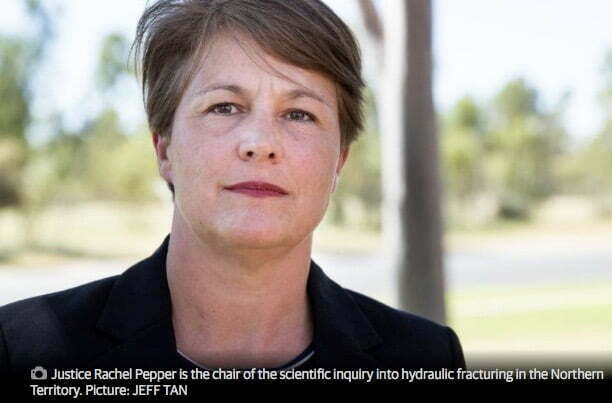 Fracking in the Northern Territory appears to be approaching approval as this news coverage of a ‘scientific enquiry’ testifies. This article is demonstrating that forces greater than government are pushing ahead with mining processes already established as highly damaging to water, soil and air. Rosettamoon is giving this journalist the corporate zombie award for services to the fracking industry for the incredibly poor copy and lack of investigation. THE rich onshore gas area of the Beetaloo Sub-Basin is a major focus of the interim report released by the Scientific Inquiry into Hydraulic Fracturing. The report, released by inquiry chair, Justice Rachel Pepper, also describes some issues surrounding water contamination as low. The inquiry was an election commitment by the Gunner Labor Government. A ban on hydraulic fracturing is in place until the final report later this year. Origin Energy’s Amungee test well is in the Beetaloo Basin. Origin ran 11 horizontal fracture stimulation stages across a 600m area averaged 1.1 million cubic feet of gas per day over a 57 day period late last year. Origin’s report estimates the original gas in place is 61 trillion cubic feet across a 1,698 sq km area with a contingent resource of 6.6Tcf or a field five times the size of Inpex’s Browse Basin, which has a 40 year life.